Welcome to the CLARIN portal of the Dutch Language Institute (INT). The INT is one of the four CLARIN B Centres in The Netherlands and it serves as an exclusive CLARIN B Centre for Flanders (Belgium). In fulfilling this role the INT provides researchers, (assistant) professors and students with (advice about) data and tools for linguistic research. The INT also offers assistance and an infrastructure to researchers or institutions that want to share data or tools that were developed in research projects in the social sciences and humanities. 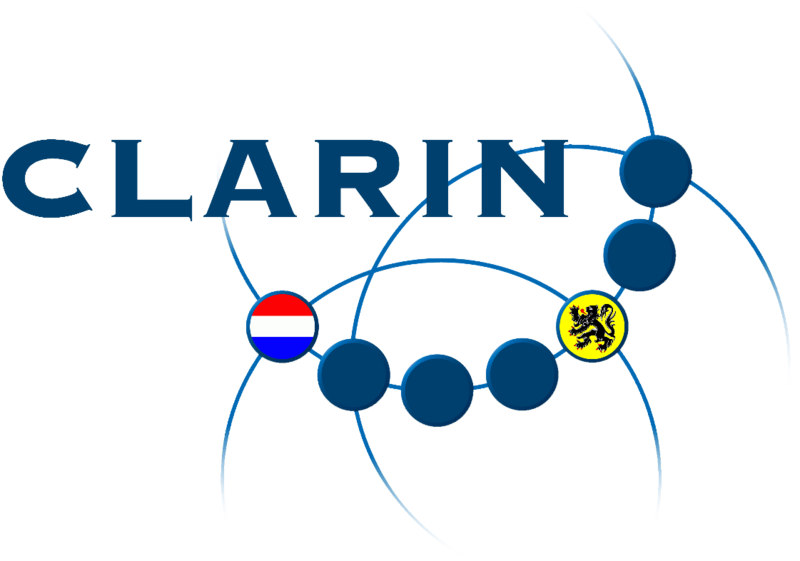 More data and tools for Dutch can be found at CLAPOP, the portal of the Dutch CLARIN community and by means of the CLARIN Virtual Language Observatory, a metadata-based portal for all CLARIN language resources and tools. This demonstrator allows users to define one or more corpora and upload data for the corpora, after which the corpora will be made automatically searchable in a private workspace. Users can upload text data annotated with lemma + part of speech tags in TEI or FoLiA format, either as a single XML file or as an archive (zip or tar.gz) containing several XML files. Corpus size is limited to begin with (25 MB limit per uploaded file; 500,000 token limit for an entire corpus), but these limits may be increased at a later point in time. The search application is powered by the INL BlackLab corpus search engine. The search interface is the same as the one used in for example the Corpus of Contemporary Dutch / Corpus Hedendaags Nederlands. The Corpus Gesproken Nederlands (Corpus Spoken Dutch) is a collection of 900 hours (almost 9 million words) of contemporary spoken Dutch from native speakers in Flanders and the Netherlands. The speech recordings are aligned with several transcriptions (e.g. orthographic, phonetic) and annotations (syntax, POS-tags). Metadata, lexica, frequency lists and the tool Corex which can be used to explore the data are included. Cornetto is a lexical resource for the Dutch language which combines two resources with different semantic structures. It includes the Dutch Wordnet which organizes words in sets of synonyms (synsets) and records semantic relations between them. It also includes the Dutch Reference Lexicon which organizes words in form-meaning units (lexical entries) and describes them with short definitions, usage constraints, selection restrictions, syntactic behaviours, combinatorial information and illustrative contexts. Cornetto can be considered as the combination of a thesaurus and a dictionary. It is accessible for human use via a web browser and it is also available in XML for computational use (opensourcewordnet). Cornetto has circa 177,000 lexical entries and 70,000 synsets. A collection of more than 800,000 texts taken from newspapers, magazines, news broadcasts and legal writings (1814-2013). The corpus is a combination of the 5, 27 and 38 Million Words Corpora and the PAROLE Corpus, supplemented with newspaper texts from NRC and De Standaard (until 2013). The Corpus Gysseling made available here consists of the collection of all thirteenth-century texts that have served as source material for the Early Middle Dutch Dictionary. It is the digital edition, enriched with part of speech and lemma, of the thirteenth-century material from the Corpus of Middle Dutch texts (until the year 1300), issued in the period from 1977 to 1987 by the Ghent linguist Maurits Gysseling. The VU-DNC Corpus is a diachronic Dutch newspaper corpus (VU Free University Dutch Newspaper Corpus). The corpus consists of data from five newspapers: Algemeen Dagblad, NRC (Handelsblad), De Telegraaf, Trouw and De Volkskrant. For each of the newspapers, data of two years (1950/1951 and 2002) are available. The articles were selected by topic (e.g. headline news, foreign news and sports). Special feature of the corpus is that both the presence of subjective elements in the articles and the presence of direct speech have been annotated. The subjective elements are annotated based on a set of lexical elements (subjectivity lexicon). As a result, the corpus is very useful to linguistically oriented researchers who are interested in diachrony and/or subjectivity and to communication scientists and media scholars who are interested in changing practices regarding the framing of coverage. The "Wurdboek fan de Fryske taal" is a scientific, descriptive dictionary containing about 120,000 entries. The dictionary articles provide information on the spelling, part of speech, pronunciation, inflection, etymology, meaning (illustrated with quotes), compositions and derivations of each keyword, along with idiomatic information (collocations, proverbs and figurative meanings). DuELME is a lexicon of more than 5,000 Dutch multiple-word expressions. The Dutch Parallel Corpus (DPC) is a 10-million-word, sentence-aligned parallel corpus for the language pairs Dutch-English and Dutch-French, with Dutch as the central language. The corpus contains five different text types and is balanced with respect to text type and translation direction. The entire corpus has been aligned at sentence level and further enriched with linguistic information (lemmas and PoS-tags). A small subset of the Dutch-English part has also been manually aligned at the sub-sentential level. GrETEL is a query engine in which linguists can use a natural language example as a starting point for searching a treebank with limited knowledge about tree representations and formal query languages. By allowing users to search for constructions which are similar to the example they provide, it aims to bridge the gap between traditional and computational linguistics. GrETEL was developed by the Centre for Computational Linguistics at the University of Leuven. Taalportaal is a large project aiming at a comprehensive and authoritative scientific grammar, originally only for Dutch and Frisian. Since 2015, Afrikaans has also been added to the original project. Taalportaal is an interactive knowledge base about these three languages, covering syntax, morphology and phonology. The Lassy Large Corpus is a collection written texts consisting of approximately 700 million words with automatically generated annotations. The lemmas and POS-tags were generated with Tadpole (now Frog) and the syntactical dependency structures were generated with Alpino. The Lassy Small Corpus is a corpus of approximately 1 million words with manually verified syntactical annotations. The lemmas and POS-tags were generated with Tadpole (now Frog) and the syntactical depency structures were generated with Alpino. The lemmas, POS-tags and syntactic tree structures were manually verified and corrected. Recent research has conclusively proven that names in literary works can only be put fully into perspective when studied in a wider context (landscape) of names either in the same text or in related material (the onymic landscape or “namescape”). Research on large corpora is needed to gain a better understanding of, for example, what is characteristic for a certain period, genre, author or cultural region. The data necessary for research on this scale simply does not exist yet. The project aims to fill the need by annotating a substantial amount of literary works with a rich tag set, thereby enabling the participating parties to perform their research in more depth than previously possible. Several exploratory visualization tools will help the scholar to answer old questions and uncover many more new ones, which can be addressed using the demonstrator. The OpenConvert tools convert to TEI from a number of input formats (ALTO, text, Word, HTML). The tools are available as a Java command line tool, a web service and a web application. OpenSoNaR is an online system that allows for analyzing and searching the over 500 million word Dutch reference corpus SoNaR developed within the STEVIN programme under the aegis of the Dutch Language Union. It is the result of cooperation between INT, TiCC - Tilburg University and company De Taalmonsters, in CLARIN-NL Call 4 project OpenSoNaR. The system incorporates the texts and metadata of SoNaR-500 and SoNaR New Media corpora. The project's main aim was to facilitate the use of the SoNaR corpus by providing a user-friendly online interface, regardless of the user's personal computer expertise. User groups representing Linguistics, Media and Communication Studies, as well as Literary and Cultural Sciences have provided practical use cases on the basis of which the interface has been developed. The system is available here for use in research and educational settings. PICCL (Philosophical Integrator of Computational and Corpus Libraries) offers a workflow for corpus building and builds on a variety of tools. The primary component of PICCL is TICCL, a Text-induced Corpus Clean-up system, which performs spelling correction and OCR post-correction (normalisation of spelling variants etc). Stylene is a robust, modular system for stylometry and readability research on the basis of existing techniques for automatic text analysis and machine learning, and the development of a web service that allows researchers in the humanities and social sciences to analyze texts with this system. In this way, the project will make available to researchers recent advances in research on the computational modeling of style and readability. The system was developed in a cooperation between the CLiPS (University of Antwerp) and LT3 (Ghent University) research groups. Text2Picto and Picto2Text are two complementary translation tools aimed at enhancing communication for people with reading disabilities. Text2Picto translates sentences into pictographs – that is, graphic symbols that serve as stand-ins for verbal communication – while Picto2Text does the reverse by allowing users to select the pictographs that they want to translate into written text. Both tools have been developed by the Centre for Computational Linguistics at the University of Leuven. WebCelex is a webbased interface to the CELEX lexical databases of English, Dutch and German. CELEX was developed as a joint enterprise of the University of Nijmegen, the Institute for Dutch Lexicology in Leiden, the Max Planck Institute for Psycholinguistics in Nijmegen, and the Institute for Perception Research in Eindhoven. For each language, the database contains detailed information on: orthography (variations in spelling, hyphenation), phonology (phonetic transcriptions, variations in pronunciation, syllable structure, primary stress), morphology (derivational and compositional structure, inflectional paradigms), syntax (word class, word class-specific subcategorizations, argument structures) and word frequency (summed word and lemma counts, based on recent and representative text corpora). The Repository "CLARIN Centre INT" gives access to language resources and tools from the INT and other CLARIN Members. The INT has obtained the Data Seal of Approval. CLARIN wants to achieve an integrated, interoperable research infrastructure of language resources and language technology. This infrastructure must be stable, permanent, accessible and expandable; it should put an end to the current fragmentation, and promote the use of computational techniques in the humanities (eHumanities). More information about the Dutch Language Institute (INT) can be found on our website. General information is also available in English.